System for "M" cylinder - motor on right: This unit is designed for use with the standard 42-1/8" L steel "M" cylinder only. See QR-OTS-U for other "M" cylinders . This unit will not fit "G" or "H" cylinders. Lowers cylinder safely and quickly to floor level for easy removal. 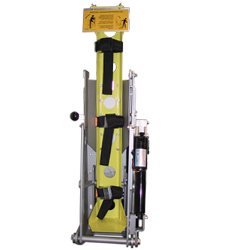 Powered by a single electric actuator meeting UL-1500 Standard for Ignition Protection, the unit has a maximum lifting weight of 160 pounds and requires 12 VDC with 14 amp circuit. Safety latch holds the unit firmly in place. Operating latch is on the opposite side of the motor. The bracket requires a mounting area of 15-1/2" W x 33-1/2" H x 10-5/8" D. Minimum door opening is 12". Occupies less cabinet space than QR-OTS-U.See QR-HHS/B for optional hand held switch and 3030-135-135 and 3030-135-138 for replacement straps.